The first ONE Championship event of the year, ONE: Eternal Glory, went down today. Japan’s Yosuke Saruta pulling off a stunning upset in the night’s main event. The 31-year-old captured the ONE strawweight world championship from defending champion Joshua Pacio via a closely-fought split decision victory. The five-round championship bout was the main event of the 14 fight card held in Jakarta, Indonesia, at the Istora Senayan. Pacio was initially scheduled to face off against another Japanese veteran Hayato Suzuki, but after Suzuki pulled out injured Saruta was drafted in as a late notice replacement. Saruta, who only made his ONE debut in December, was the more aggressive fighter throughout the contest. The former Shooto Strawweight World Champion’s unorthodox stance and constant forward pressure appeared to unsettle Pacio. The 23-year-old appeared unable to establish any attacking rhythm apart from one brief explosive moment at the tail end of the third round. The bout was somewhat of a stop-start affair with neither fighter able to fully impose their will on the other. Saruta had success taking down Pacio over the course of the bout, but once there was unable to keep his opponent on the ground for any length of time or cause any significant damage. It was the Japanese fighter’s aggressiveness that would gave him the edge in the eyes of the judges. Both men had success on their feet, but it was Saruta who forced the action. Going into the final frame, the result hung on a knife’s edge. 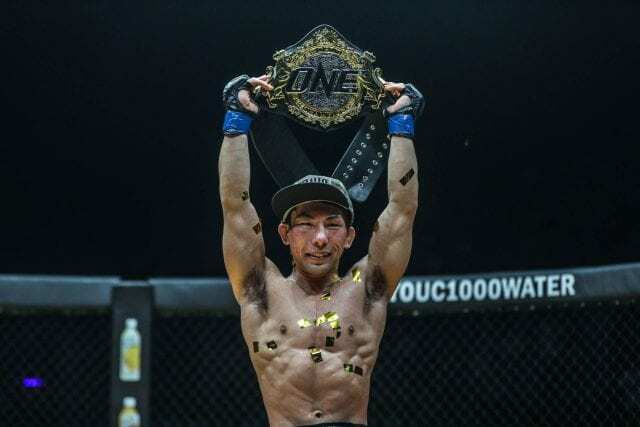 ONE Championship bouts are judged on their entirety as opposed to a round by round basis and if Pacio had pushed the pace and come out guns blazing he may have left the cage with the belt still strapped around his waist. However, it was Saruta, perhaps sensing that this was going to be his night, who seized control of the final moments. A takedown in the final seconds, followed by a final wild flurry of blows cemented Saruta’s victory. Now the question is, can he hold on to the belt? None of the last three strawweight champions have been able to mount a successful title defense, so it will be interesting to see if Saruta can break this pattern. 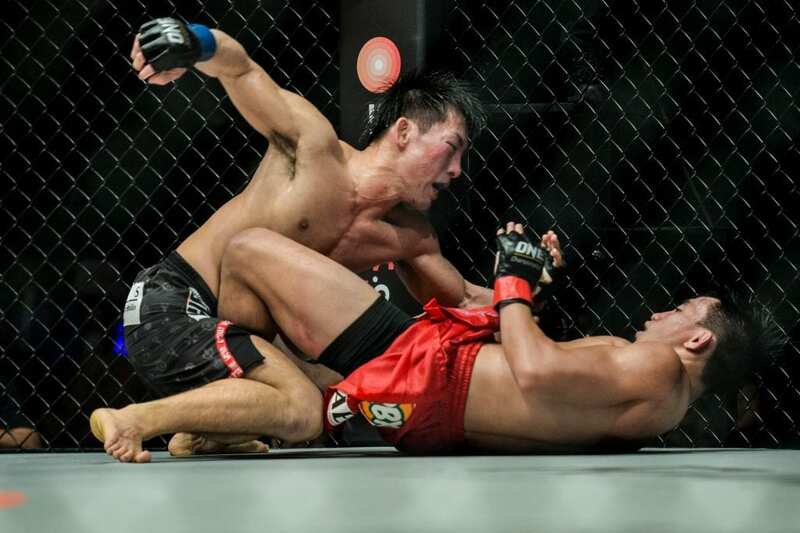 It was a short day at the office for Singapore’s Christian Lee, who needed less than three minutes to defeat Edward Kelly in a rematch of their 2018 bout. The 20-year-old dominated the contest from the outset in much the same way he did when the pair previously fought. The two last met in September at ONE: Beyond The Horizon. Lee was in full control of the fight and looked to be on the verge of victory before being disqualified after performing an illegal suplex. Tonight, the six-time Pankration world champion’s grappling was just too slick for Kelly to handle. Lee took the fight in the ground in the opening minute, and from then on the result looked inevitable. Kelly attempted to get to his feet, but Lee gave him no opening. The referee stopped the fight once Lee’s ground and pound overwhelmed the Filipino. In his post-fight interview, Lee called for a rematch with ONE featherweight world champ Martin Nguyen. Lee is on a two-fight winning streak but has not fought any of the top contenders in the division since his split decision loss to Nguyen last May. Another crack at the title may be warranted, but it would make sense for Lee to first get a victory over one of the division’s top-tier fighters such as Narantungalag Jadambaa before he gets another championship shot. Earlier in the night, India’s Puja Tomar stunned the home crowd when she recorded her first ONE Championship victory, defeating high-flying Priscilla Lumban Gaol via split decision. Coming into this fight, Lumban Gaol appeared to be next in line for a shot at Angela Lee’s atomweight crown. The 30-year-old Indonesian had a breakthrough year in 2018, winning and competing in, more fights than any other athlete on the roster. It was expected that her striking and overall ability would be too much for Tomar to handle. However, the Indian fighter was one who dominated the stand-up, especially in the first round, landing several heavy shots. Lumban Gaol had some success in the second and third on the ground, but not enough in the eyes of the judges.